MASCOTTE, Fla.--(BUSINESS WIRE)--Aug. 23, 2018-- KB Home (NYSE: KBH) today announced the grand opening of The Gardens at Lake Jackson Ridge, the builder’s latest community of new single-family homes in Mascotte. Conveniently located near Highways 50, 33, and 19 and Florida’s Turnpike for easy commuting to Lake Buena Vista and downtown Orlando via Interstates 4 and 75, The Gardens at Lake Jackson Ridge is also close to major family-friendly entertainment destinations such as Universal Studios® and Disney World®. 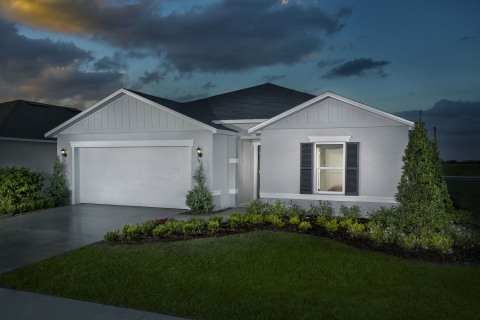 Residents of The Gardens at Lake Jackson Ridge can enjoy the community’s proximity to historic downtown Clermont, which features shopping, dining, and entertainment establishments in a charming small-town atmosphere. Nearby Lake David Park includes picnic areas, playgrounds and basketball courts, and Lake Catherine Blueberries offers a variety of family activities such as seasonal berry picking, live music, and special events. Nature lovers will relish the opportunity to explore the area’s abundant nature reserves, including Ocala National Forest, Green Swamp Wilderness Preserve and Lake Apopka. KB Home will host a grand opening celebration at The Gardens at Lake Jackson Ridge on Saturday, August 25 and Sunday, August 26 from 11:00 a.m. to 3:00 p.m., during which attendees may tour the two elegantly appointed model homes. Refreshments and family entertainment will be provided. At The Gardens at Lake Jackson Ridge, KB Home will be constructing one- and two-story homes and offering six distinct floor plans that range in size from 1,500 to 2,500 square feet and include up to four bedrooms and two-and-a-half baths. Spacious great rooms, beautiful master suites, and dedicated laundry rooms are among the desirable features characteristic of all the KB homes at the community. Pricing begins in the low-$200,000s. The KB homes at The Gardens at Lake Jackson Ridge will be built to current ENERGY STAR® guidelines and include WaterSense® labeled faucets and fixtures, meaning they are designed to be more energy- and water-efficient than most typical new and resale homes available in the area. These energy- and water-saving features are estimated to save homebuyers between $900 to $1,500 a year in utility costs, depending on the floor plan. The Gardens at Lake Jackson Ridge sales office is located at 1725 Garden View Street in Mascotte. From Bluff Lake Road (SR-33), turn left onto Centennial Park Way and make a right onto Garden View Street; the sales center will be on the left. The sales center is open Saturdays through Thursdays from 10:00 a.m. to 6:00 p.m., and on Fridays from 12:00 p.m. to 6:00 p.m. For more information about The Gardens at Lake Jackson Ridge, or KB Home’s other new home neighborhoods, visit www.kbhome.com or call 888-KB-HOMES.